Perhaps the biggest surprise at the Wine Bloggers Conference tasting at Monticello last Friday evening was not that we could taste any wines in 100+-degree heat (and some people couldn’t). Rather, there was a Virginia pinot noir that wowed the crowd. “It tasted like pinot!” were the exact words spoken by Jancis Robinson, the über-oracle of wine writing, and Eric Asimov, wine writer for the New York Times, when I asked their impressions of the Ankida Ridge Vineyards 2010 Pinot Noir. “Tastes like pinot” may sound like damning with faint praise, but in this context it really is a nice endorsement. Personally, I thought the Ankida Ridge was better than a lot of pinot noir I’ve tasted recently from California – it had great acidity, minerality and structure, with none of the brown sugar fruit and cloying sweetness that drag many pinot noir wines into mediocrity. This was my first taste of the Ankida Ridge, but I was not surprised by its quality, if only because I knew Lucie Morton, the vineyard consultant who is revolutionizing viticulture on the East Coast, was involved. Last August, I followed Lucie from her home in Charlottesville to the Ankida Ridge vineyard, about an hour’s drive south to Mt. 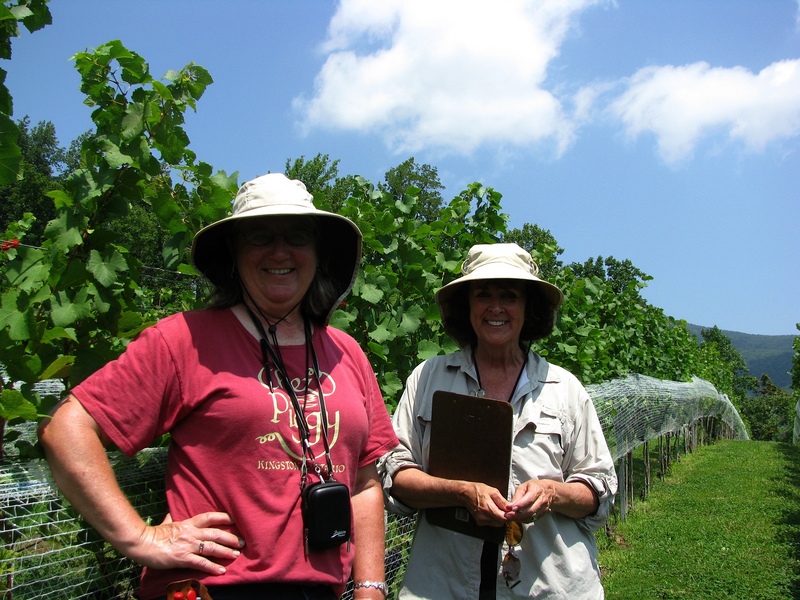 Pleasant, west of Amherst, Va., to visit proprietor Christine Vrooman at the vineyard. My prissy little Prius couldn’t handle the unpaved road up the steep slope, so Christine’s son, Nathan, rescued us in his pickup truck for the rest of the drive up the hill to 1,800 feet elevation. That’s high for Virginia. 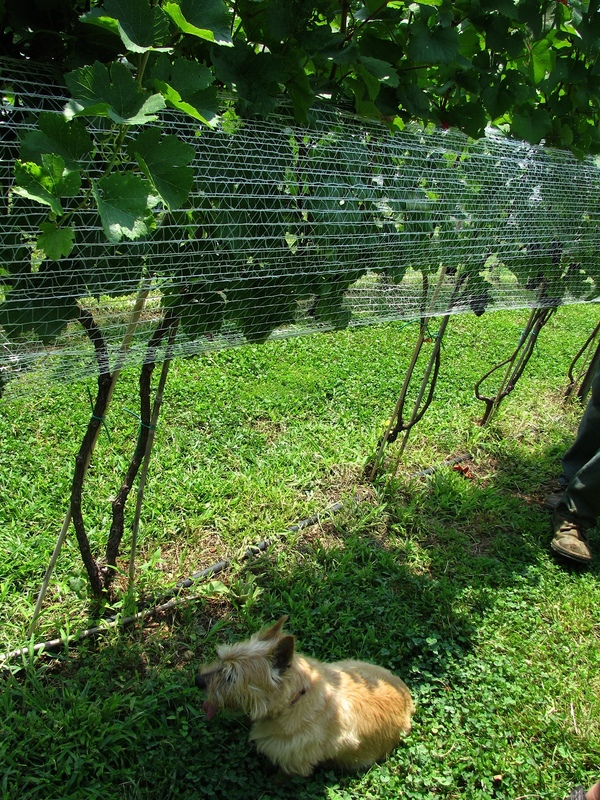 Lucie Morton's faithful assistant, Randy, inspects the vines. You can tell Ankida Ridge is a Lucie Morton vineyard because of the dense spacing and the close-cropped, vertical shoots of the vines, rather than a sprawling canopy. There’s more to her vineyards, of course, but those are the easy visual clues. Her clients in the mid-Atlantic include Boxwood, Rosemont, Chatham, Black Ankle, and Sugarloaf Mountain vineyards. Now let me say two caveats about Ankida Ridge: At first glance, this would seem to be just another Virginia vanity winery. Christine and her husband, Dennis, a veterinarian in Virginia Beach, owned the hilltop property and home as a summer retreat and decided the mountain view from their balcony wasn’t pretty enough without vines in the foreground. They did not seek out the best land to grow grapes, they just happened to own it. And they hired the best vineyard consultant to help them. They also hired a talented winemaker – Mathieu Finot, winemaker at King Family Estates in Crozet, northwest of Charlottesville, is their consultant winemaker. Second, Ankida Ridge, no matter how good, will not be revolutionizing the Virginia wine industry. That’s because the vineyard is only about 1.5 acres in size. Christine Vrooman said she envisions selling all their wines by mail list, and she can probably do it. There are only 3,500 vines – 2,500 planted to pinot, and 1,000 chardonnay. The 2010 vintage was only their third leaf, so the first production, and the wines we were tasting at Monticello are merely a hint of things to come. (The Vroomans bought some fruit to round out the blends, but plan on going fully estate when the vineyard reaches full production.) Ankida Ridge wines will always be hard to find, and while they may shatter some myths about Virginia viticulture, they will never be able to become mainstream. Still, that the pinot noir from third leaf grapes could “taste like pinot” is pretty special. The chardonnay was darn good, too – minerally, with a clear focus that could rival Linden’s Hardscrabble for best Virginia chard if there were enough of it. Morton called Ankida Ridge “a little Burgundy in the mountains.” It may be the Vroomans’ little hideaway, but I’m glad they’ve shared it, and I wish there would be more. PS: Christine Vrooman is an excellent photographer and blogger, and the Ankida Ridge website is well worth checking out. Photos in this post: Dave McIntyre. Gallery | This entry was posted in DrinkLocalWine.com, Eastern US, Local Wine, Virginia, Weblogs, Wine. Bookmark the permalink. This is an exciting report, Dave. Thanks for all the background. I had a chance to stop by the Ankida Ridge table at the Monticello event and agree that they certainly lived up to the buzz we’ve been hearing. Dave, I thought all the wine at WBC sucked and that it was only there because of the sponsors. How could that pinot have been any good? It was a great wine. I was very impressed. Their chardonnay was pretty great too.